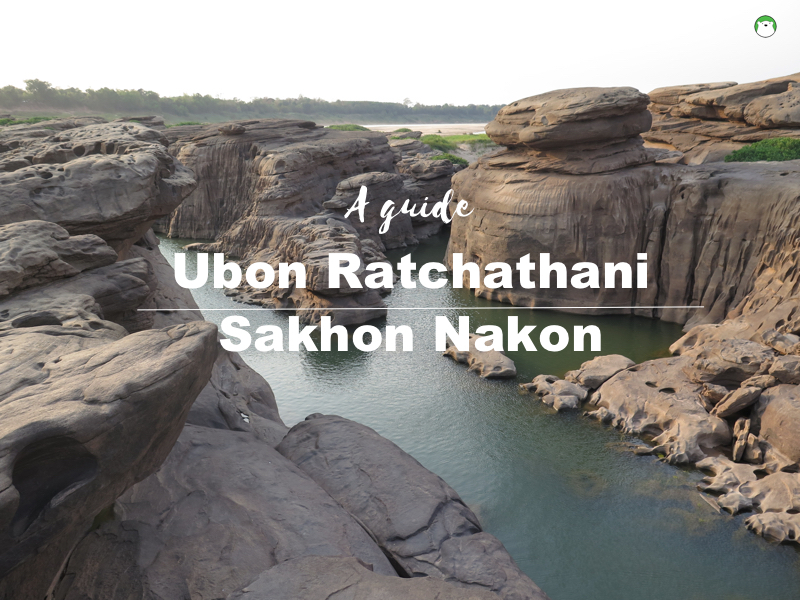 Following our video on Ubon Ratchathani and Sakon Nakorn above, these are the practicalities and details about how we got there and where to stay, eat and shop in those two Northeast provinces of Thailand. 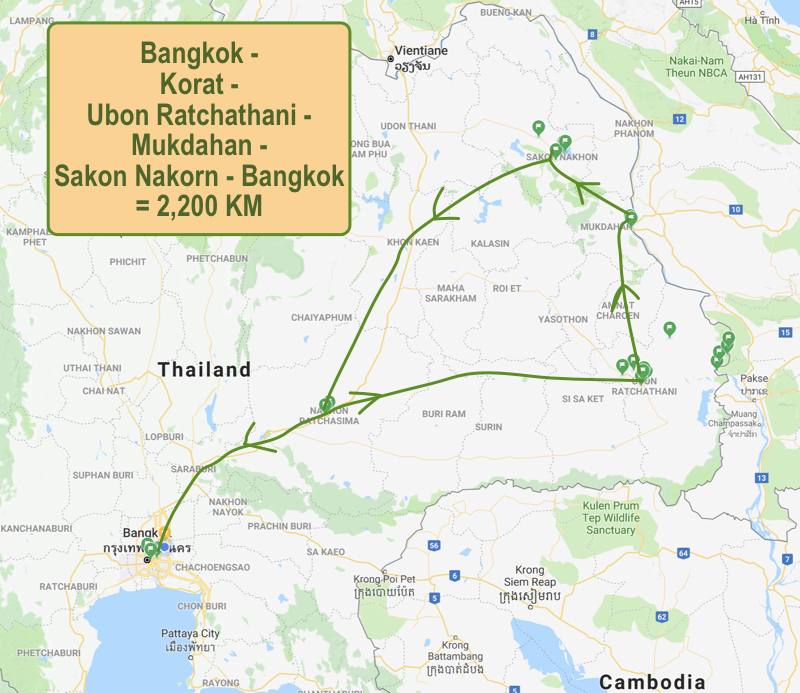 Ubon Ratchathani (อุบลราชธานี) is about 600 km NE of Bangkok. This center of the lower NE region used to have the largest area on Thailand before big chunks of it were separated into two new provinces: Yasothon in 1972 and Amnatcharoen in 1993. The city of Ubon Ratchathani sprawls across the River Mun, with key attractions spreading out, hence a lot of driving around. We just chose this 3-star hotel out of from piles of reviews. It sounded good, not expensive and quiet. Turned out, it is all the above plus the super friendly and excellent service. 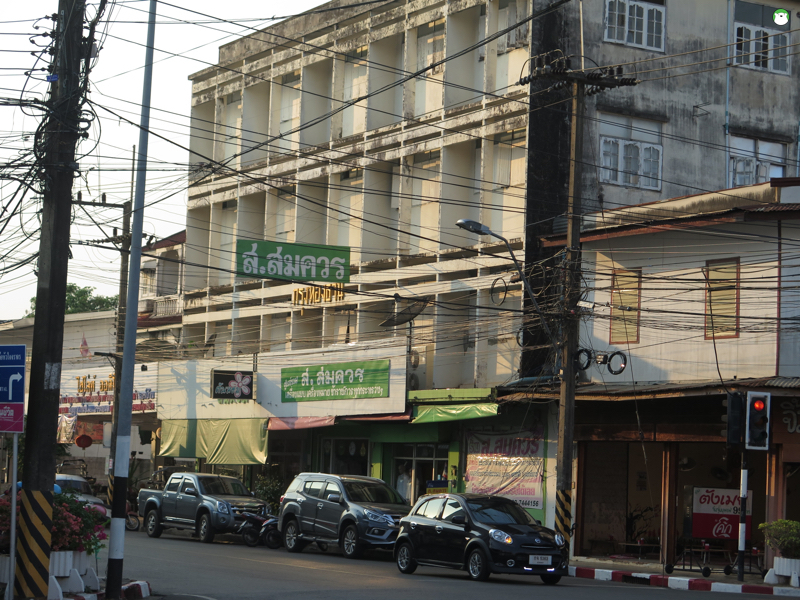 This hotel is in the middle of the Ubon city, but tucked away in a quiet alley, which I liked. But this location might not be very convenient for those without a car. Ubon’s staple for bus is their song thaew shuttles. Their routes can be studied, if not followed by the letter, via this website. Pen Ta Hug’s room is pretty much standard for this type of a hotel, but they made an effort to hype up the vibes with murals and chaise lounge. Our room was clean enough, but there’s no view given that we were on the second floor with the balcony facing the busy parking space (people can just look up and in), hence always with the curtain pulled closed. We do love their hearty breakfast, though. On their daily brekkie buffet are arrays of Thai rice and curries, Ubon’s Vietnamese style pan eggs and noodles, Thai desserts and assorted ice cream. If you wish to have yourself a gourmet coffee, they do offer a 30% discount. The utility black and milked coffees are available as complimentary as part of the complimentary meal. 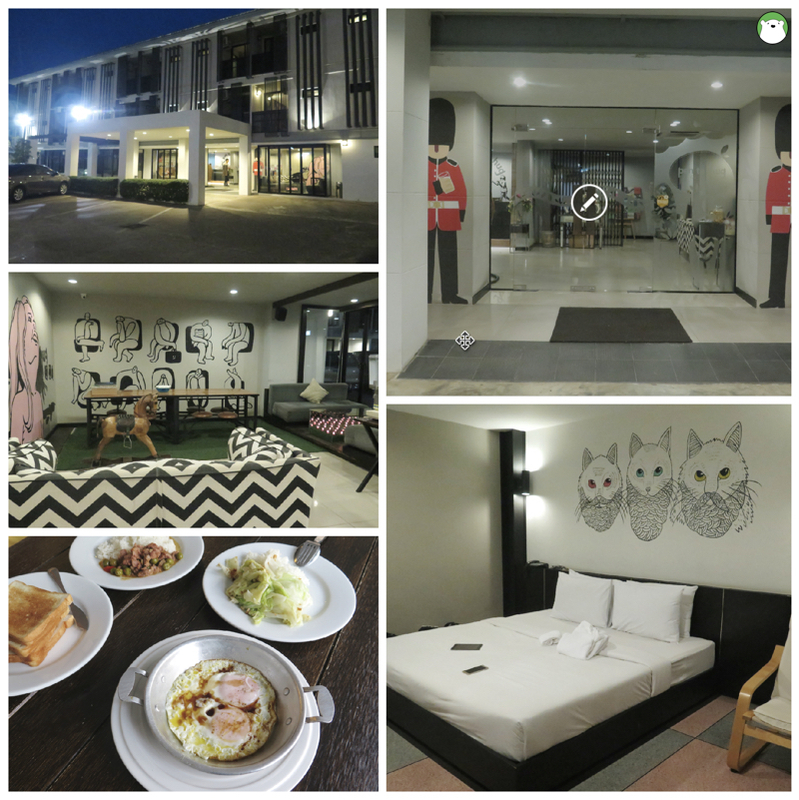 Pen Ta Hug Hotel (โรงแรมเป็นตาฮัก แปลว่าน่ารักมากๆ ในภาษาอีสานเด้อ). 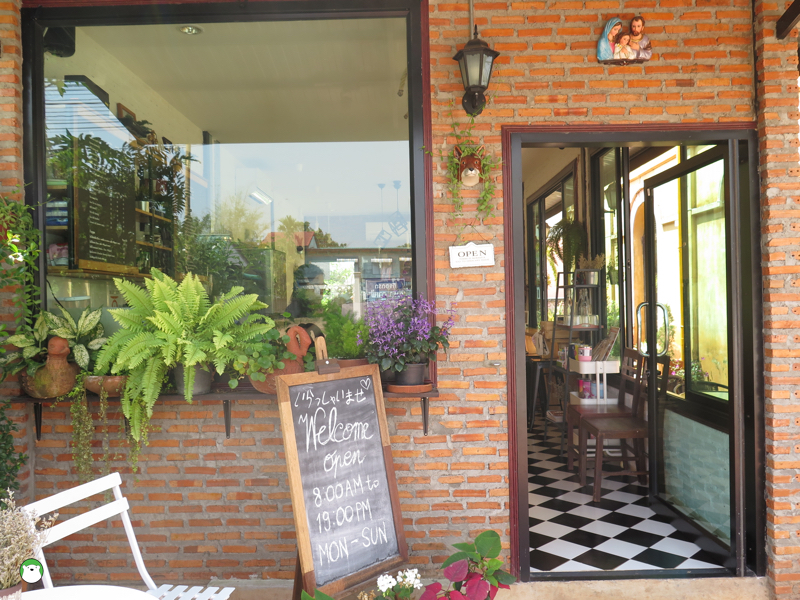 Located in the middle yet charming nowhere, this cafe is the outshoot of the small, millennial-run cafe of the same name in Ubon’s town. But don’t bother to go there if you drive, though. Their location in the city has no parking, and is situated in a tight, narrow, crowded alley of the old town. This farm cafe, as I said located in the middle of nowhere of Khemmarat district, has parking aplenty, and nice cover look. 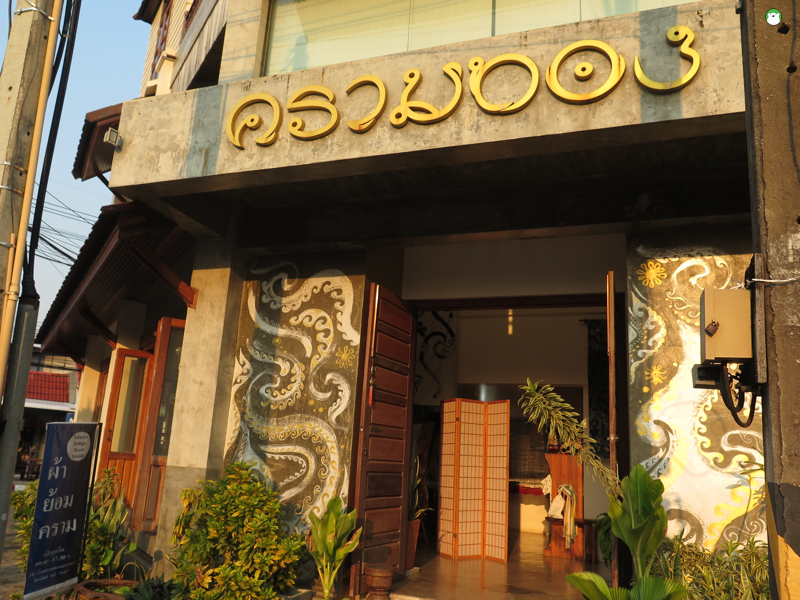 If you are looking for a nice enough stop on route to Gaeng Chom Dao or Sam Pan Bok, this place is a good option. But we found our coffees (both latte one hot one cold) diabetes-inducing sweet. They also offer foods, too. But we were just too full from our previous stop to try. The Goose Farm Cafe. **Note: driving time from Ubon Ratchathani town to Khong Jiam is about 1 hour, on a roughly 90-km distance. I have heard soooo much about this oldie and staple eatery, and upon our real visit, I kinda know why. From outside, this place looks just like any regular time-worn tourist restaurant, but their plating, using stainless steel dishes and all, are so instagrammable. The rustic looks of their food, the eclectic platings and the natural colours on the plates make this place so appealing. We had a plate of fresh spring roll, which tasted OK. But the fried ones literally had oil dripping off each piece. Ubon foods contain hefty amount of pork meat, fat and organ and they all appeared on the side dish of Vietnamese style somtam that my hubby ordered. The stuffed sticky rice was nice for a change. We also ordered a plate of Nam Noung, which is quite delish. Overall, good, but not that good. Indochine. Daily: 10.00 – 22.00. Note: No parking, but we managed to park at the nearby Shell Gas Station. So, instead of follow good pictures from IG, we decided to try this restaurant that got a bunch of unanimous vote online for being ‘good, delicious and reliable.’ Santi Potchana is a Chinese style boiled rice-and-sides kind of restaurant. Naturally, it is only open for dinner. We came back from our lengthy day trip and made it here for our dinner. Turned out that this is the best meal we had in Ubon Ratchathani. ha ha. The service was crisp and efficient, the food clean and tasty and not expensive. Everything on our table there was delish and we paid less than Bt400 plus rice and drinks. Santi Potchana (สันติ โภชนา) T: (+66) 045 240 233, Daily: 16.00 – late. 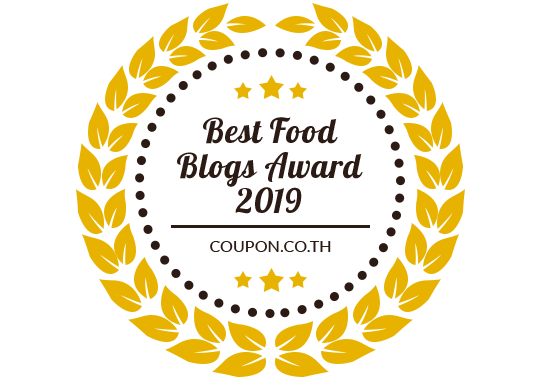 NOTE: Before ending out eating recommendation in Ubon Ratchathani, allow me to explain that we did eat more than we posted here. But here are only what we would recommend. There are places I wouldn’t mind skipping, despite some rave reviews, because they are not special + expensive, albeit nice looking with GREAT stories. 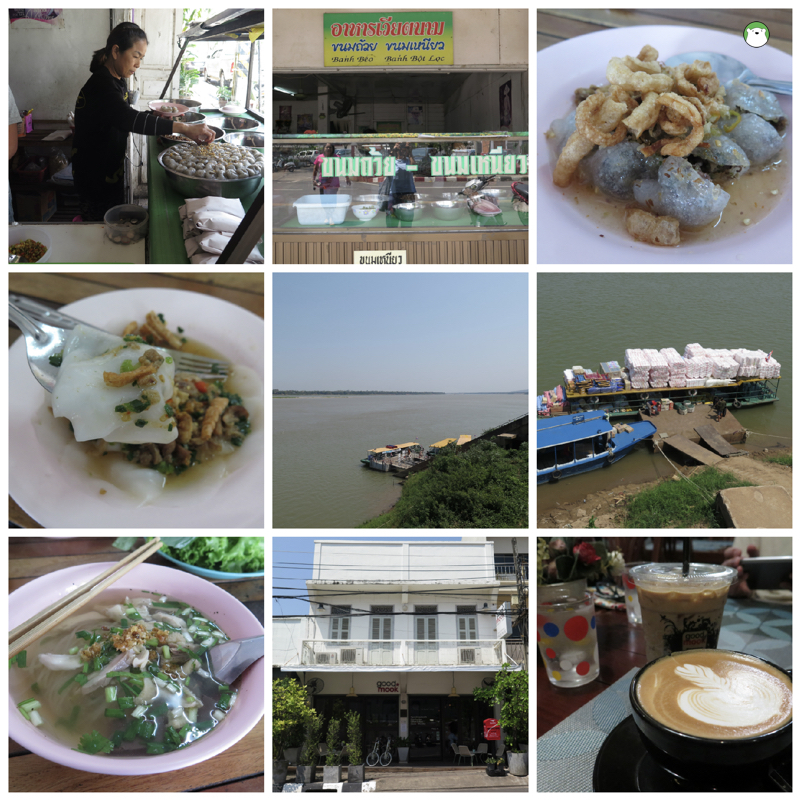 On our way to Sakon Nakorn, which is 280 KM from Ubon Ratchathani (or about 4 hours driving), we made a stop at Mukdakhan province, another small Mekong town and found their food pretty lovely. As usual, I timed our trip to stop for lunch there because I heard that they have this one-of-a-kind ‘Vietnamese dishes’ served during the short lunch hours in a shophouse in front of their main police station. Turned out this meal was quite lovely. Pictured below is the meal, and the shopfront. We also had enough time for a coffee. Good Mook Cafe, their Starbucks, serves amazingly good latte. Deserve a detour if you ask me. Nice location and space as well. We took a look at the Mekong River of Mukdaharn, and found floating there a boat with its roof piled high with styrofoam, ready to be somewhere. This is scary, scary. 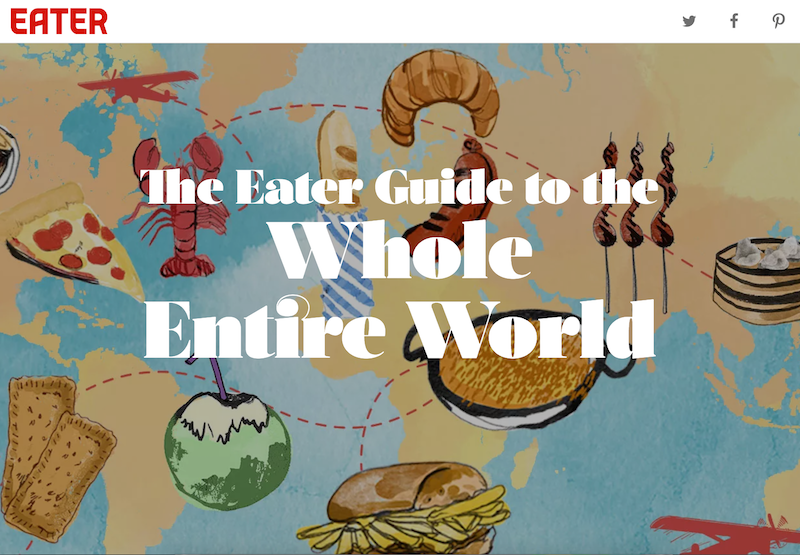 We all have heard about these trashes and the attempts to reduce wastes and everything. But take a look here. Nonchalant and carefree. Vietnamese lunch: Kanom Tuay Kanom Niew Na Rong Pak (ขนมถ้วย ขนมเหนียวหน้าโรงพักมุกดาหาร), daily during lunch hours. T: (+66) 083 145 1796. STAY>> Yeah!!! We finally made it to Sakon Nakorn. 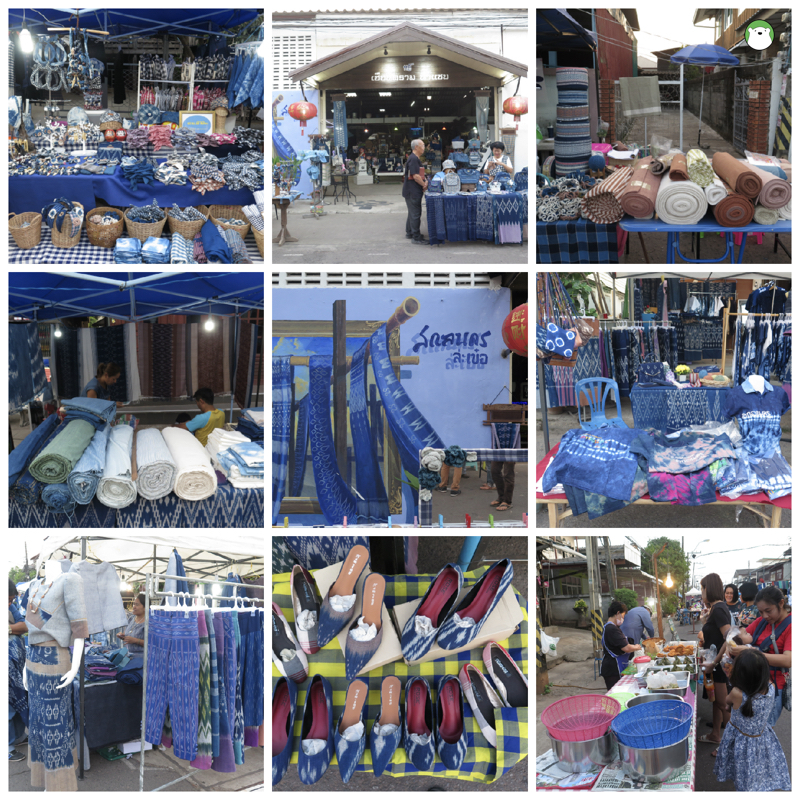 In fact, this particular Esarn province has been on my list for a long time, because I have always wanted to check out their famous indigo-dyed cottons (which could cost arms and legs when brought and sold in Bangkok’s fairs). The only thing that had deterred me to make the trip here is the hotel. I couldn’t find the right hotel until my friend told me about @Sakon. We don’t need to be in a luxury five-star, but definitely require a nice, clean, and decent and safe place to stay. @Sakon is a brand new hotel with spacious room. In-premises parking and clean bathroom. We booked online and paid less than Bt1,000 per night. Fantastic. With breakfast, too, but not as good as Pen Ta Hug. @Sakon. Every weekend (Sat+Sun) from around 15.00 – 18.00 or a bit later, there’s ‘walking street’ (ถนนคนเดิน) on Reung Sawas Road (ถนนเรืองสวัสดิ์) in front of Wat Phra That Cherng Chum temple (พระธาตุเชิงชุม) in Sakon Nakhon town where you can browse through lines of indigo-dyed cotton shops that turn the whole street into blue. Sakon Nakorn is now seeing a strong revival of their native wears. 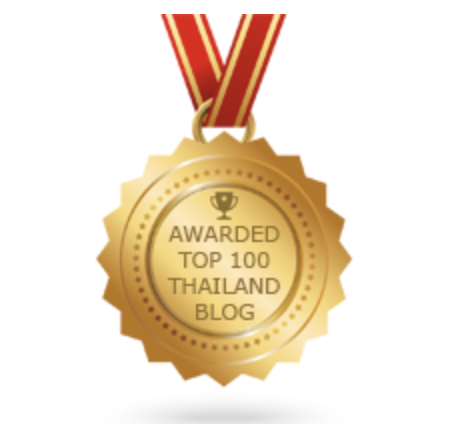 As you might have already known, indigo is a plant shrub that used to grow naturally and abundantly in this part of Thailand. It was the wisdom of our ancestors who, for some reason, got to know that the plant, when soaked, can be used as the natural colouring. You might think that indigo is naturally blue, but in fact it is not. It is yellow first and the oxidation process is the one that turns the initial yellow into a permanent blue. Shades of indigo-dyed fabrics are then depended on the length of the soaking and oxidation. So, if you want to know whether the fabric you are wearing is really dyed with indigo, there’s an easy telltale sign. If the blue hue washes off on your body or during the rinse, then the dying is fake. But if it stays put, then it’s truly indigo. 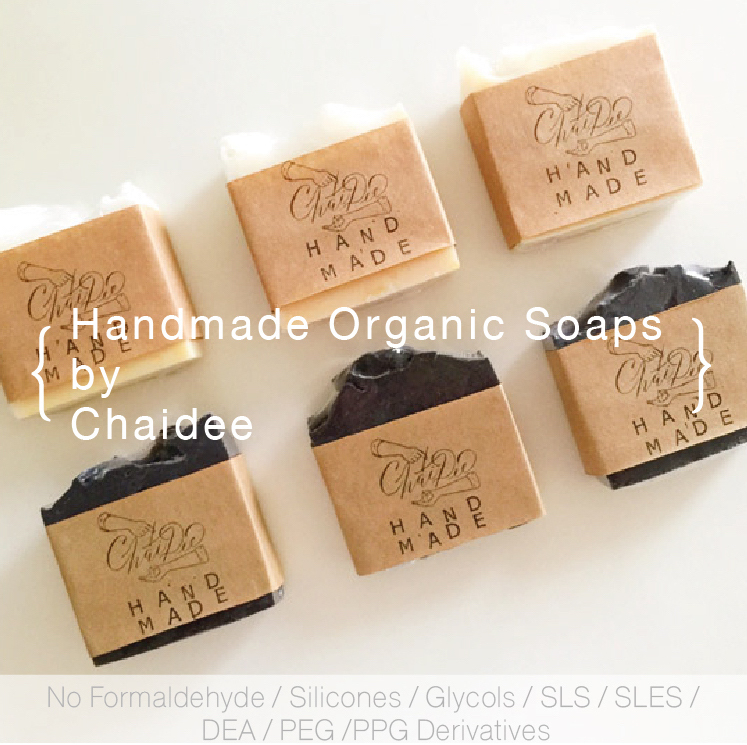 Just because the natural oxidation is the permanent fixer. How genius. These cottons are available in tons of patterns and styles. And the real ones are quite pricey. You can walk this street and shop around. 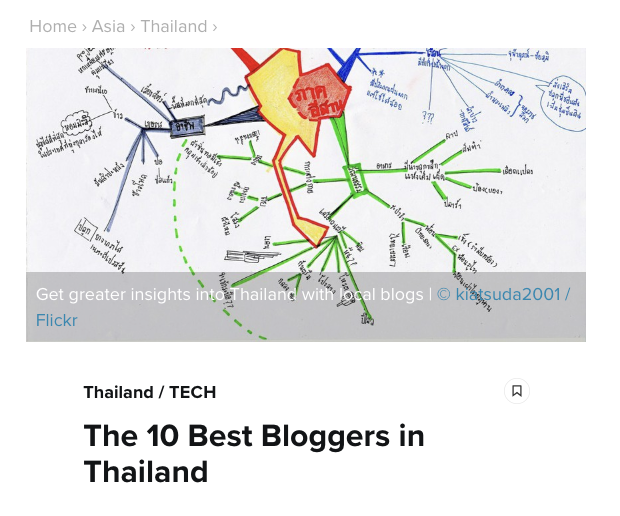 But as I have recommended in our video, I liked the two places most (Kram Sakon (ครามสกล) and Kram Thong (ครามทอง) with the second one my first choice and Mudmee pattern my first, although expensive, recommendation). 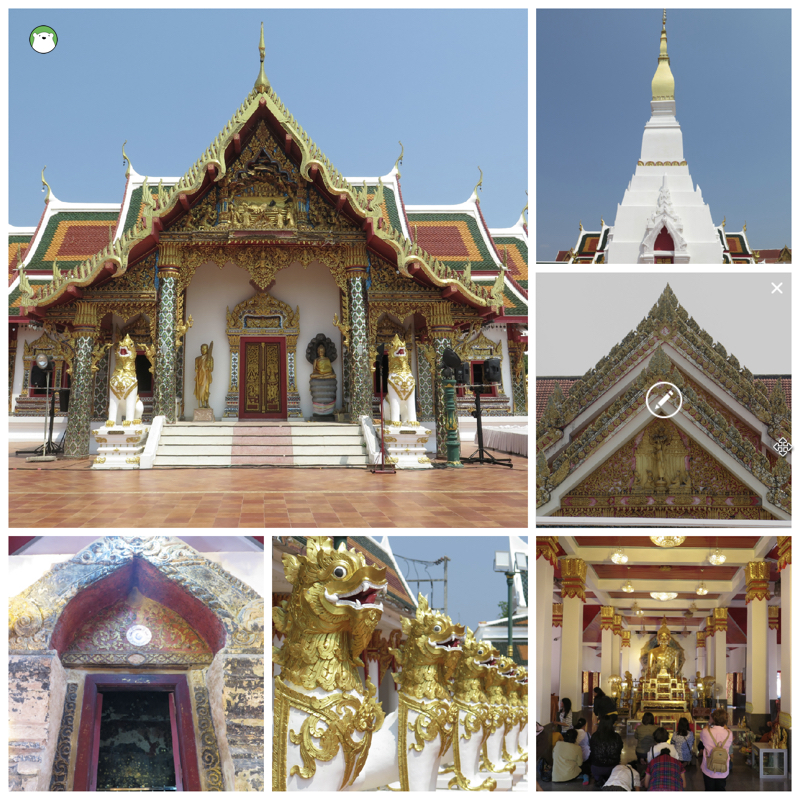 And while you are at the walking street, it is worth a visit to the ancient Wat Phra That Cherng Chum วัดพระธาตุเชิงชุม, the main sacred temple of Sakon Nakhon. 1. 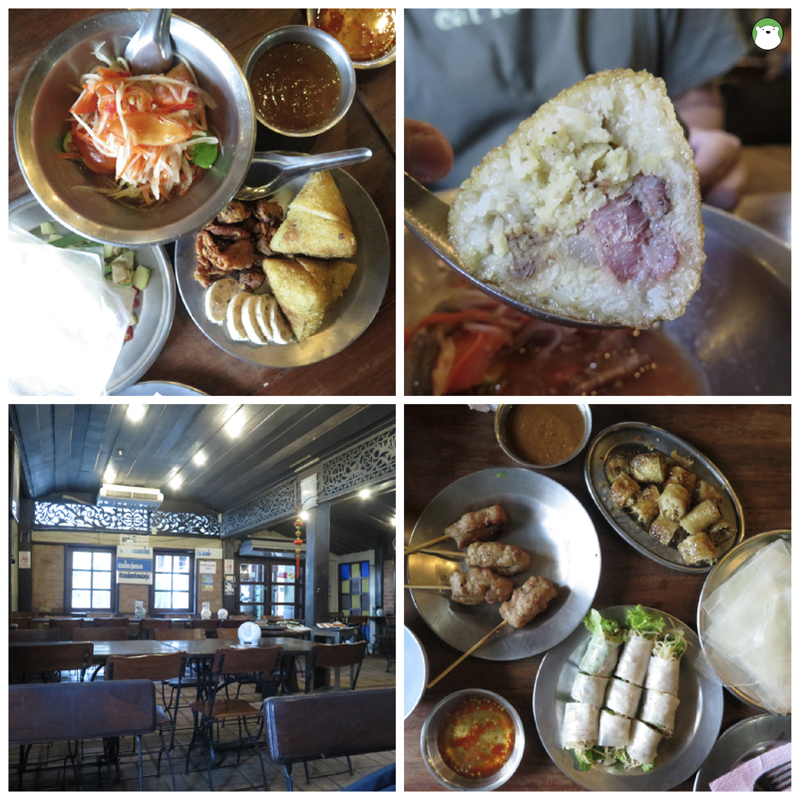 Eating in Sakon Nakhon proved to me much better than Ubon Ratchathani. Real, tasty, homey, and honest. We had an early dinner the first day at Saban-Nga (สะบันงา) Thai restaurant. 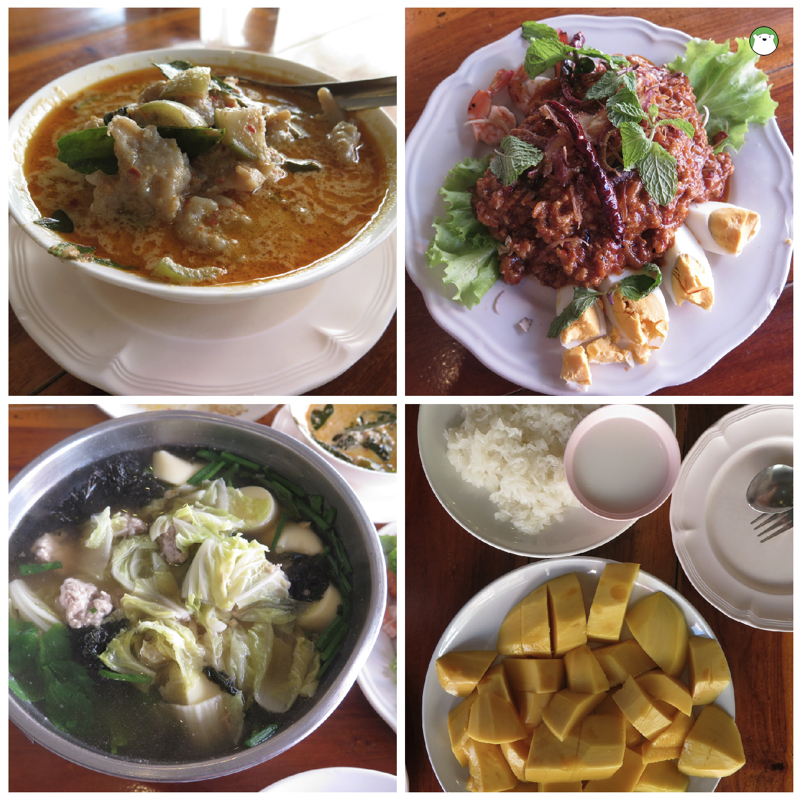 Fish cake curry, spicy salad of banan blossom (too heavy in all tastes for me, but ok), clear soup of mixed veggie and minced pork, a plate of stir-fried morning glory and a big plate of mango and sticky rice. All delicious. 2. 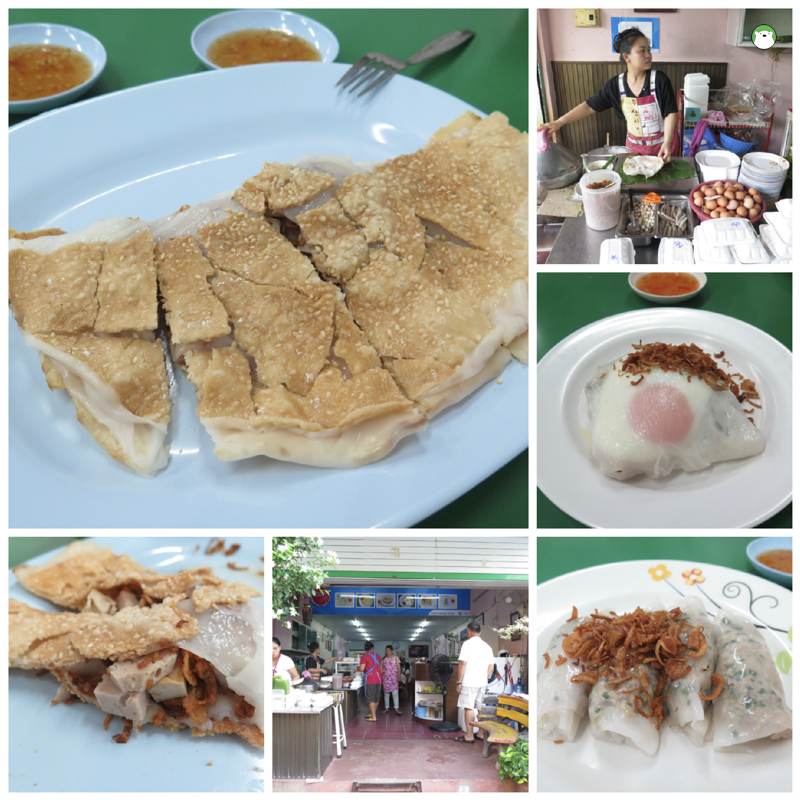 Paris Rice Crêpes ปากหม้อปารีส is another popular Sakon Nakhon’s staple. This Vietnamese rice crêpes are made from rice flour (rice grains soaked overnight and then ground with stone mill) over steaming bath and filled with minced pork, pork sausage, eggs and so on. The brown thing on top is crispy toasted shallot. And these variations are all served with sweet and sour and clear dipping sauce. The crispy version pictured on top is particularly tasty, with sesame-toasted crispy crêpe draped over the soft chewy one. 3. 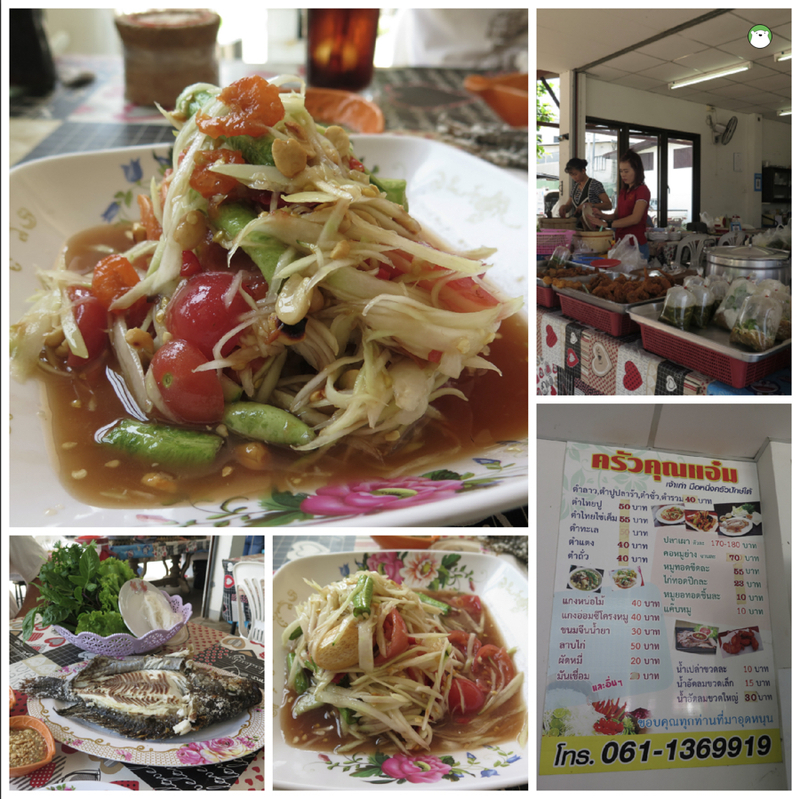 Krua Khum Am (ครัวคุณแอ๋ม) apparently is a lunchtime favourite of the locals. This is a typical ‘Esarn’ style somtam place with a good variety of somtam (papaya pok pok), BBQ varieties, salt-baked river fish, sticky rice, Esarn-style soups and so on. People just stopped by in droves and we were advised to come early if we want to choose from their available aforementioned sides. No FB page, but the restaurant is located right across the one below. And their phone number is already in the picture. 4. 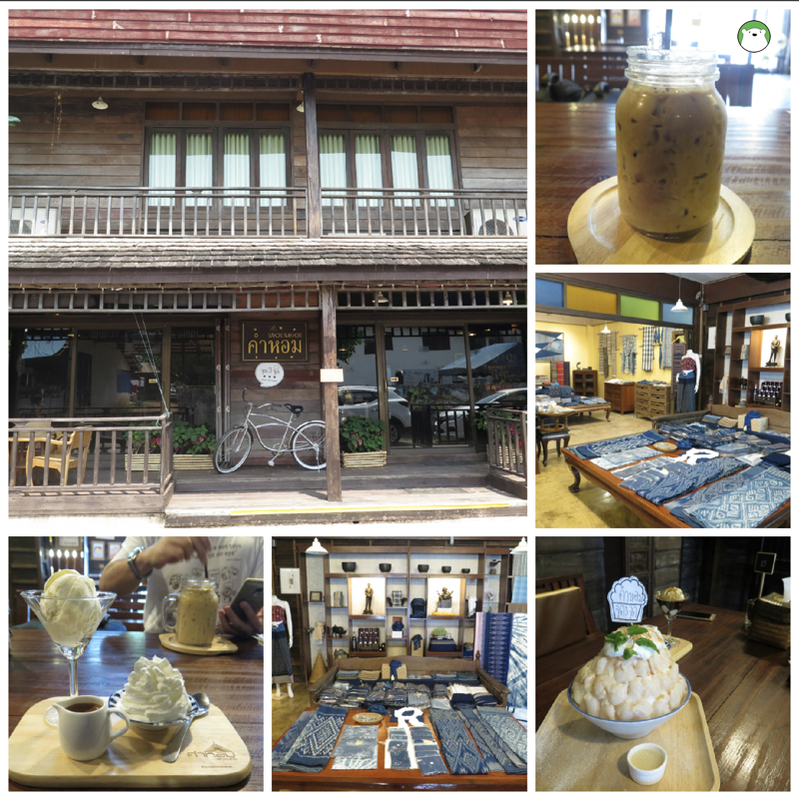 Kham Hom Cafe (คำหอม) is a good looking cafe with a variety of desserts and coffees and a dedicated space for Sakon Nakhon’s indigo fabrics. Their coffees are OK, but nothing to be impressed of. I ordered an affogato and was served with a supermarket-grade (meaning perfumed with strong industrial scent) vanilla ice cream, a shot of caffeine and a pile of whipped cream (why?) and our ‘bingsu’ with lychee was pile of natural grated ice draped with canned lychee. No taste whatsoever on the ice. But this is a nice space to stop by, beautiful decoration, and not expensive. 5. Mitr Uppathum (มิตรอุปถัมป์) is another staple of Sakon Nakhon. The place is open only for breakfast and lunch (closes at 14.00) and is closed Tuesdays. They serve breakfast with their full menu, meaning apart from the egg variety and hot drinks, other one-plate meals are also available. For example, stir-fried minced chicken with holy basil and fried egg. I like their breakfast sandwich. Simple but nice. 6. Kram Sakon (ครามสกล). 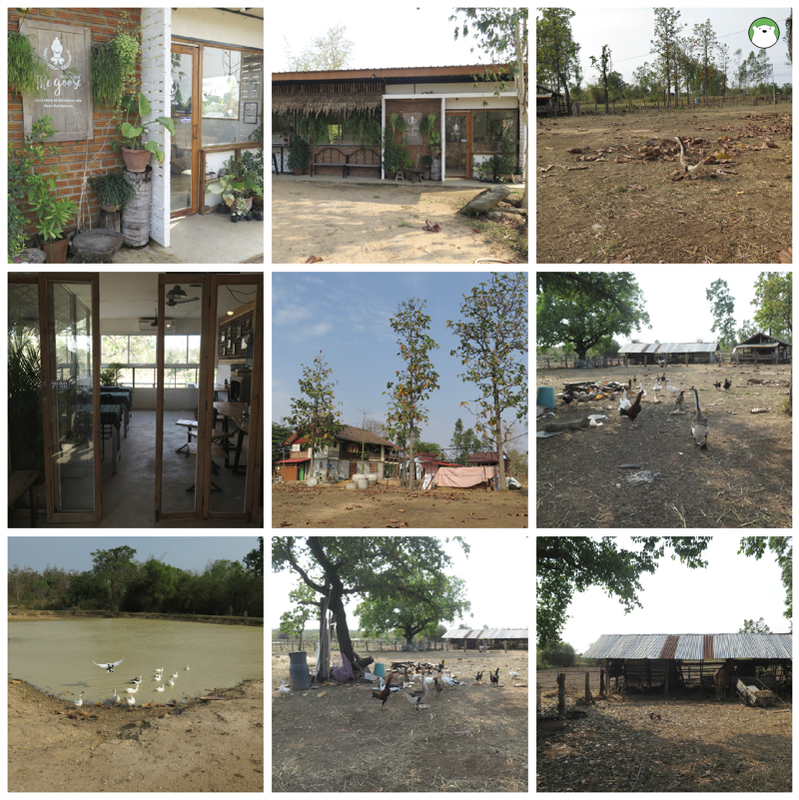 This is one of my favourite places in Sakon Nakorn. For their fabrics (affordable, but not as sharp), and their food which was surprisingly good. Love their pizza. Crusty, tasty, well-done. 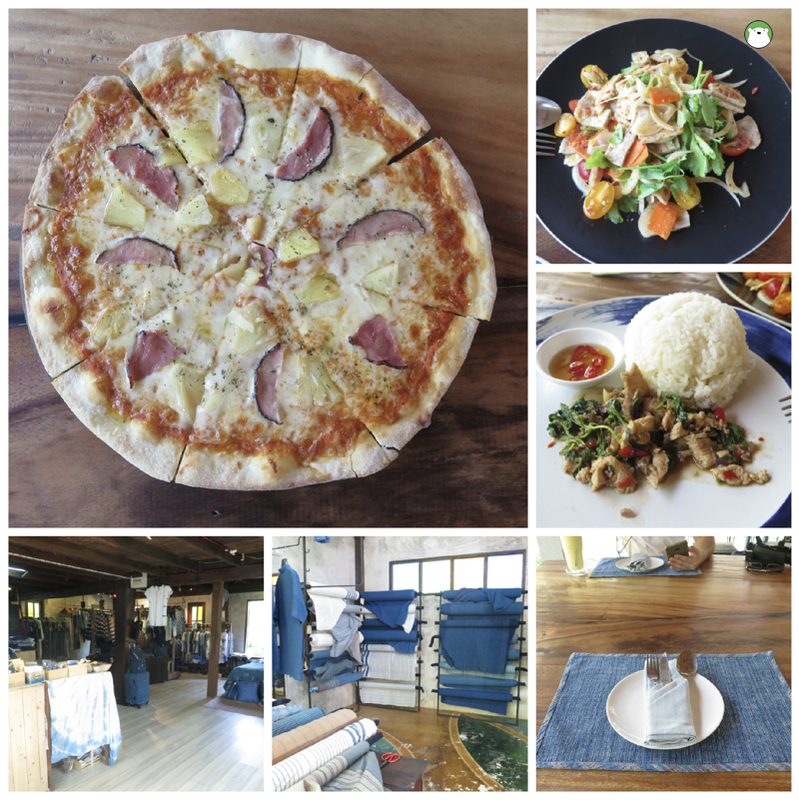 Who would have thought that pizza in Sakon Nakhon would be this delicious. And inexpensive, too. 7. 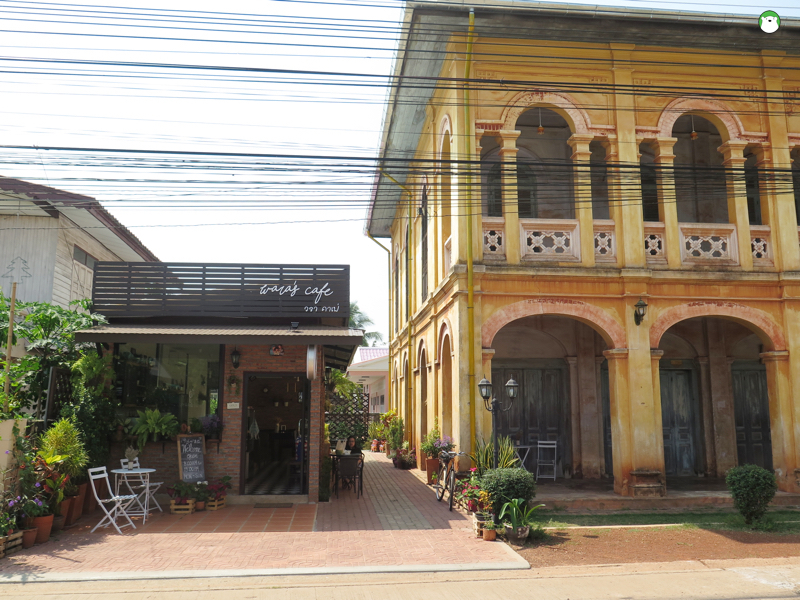 Waras’ Cafe, Tha Rae (วรา คาเฟ่, ท่าแร่ สกลนคร) This small gourmet cafe is tucked beside a historic mansion of Tha Rae. Good, decent gourmet coffees, homemade pastries and cakes. Discounts for those bringing their own mug and not using straw! YEAH! Sakhon Nakhon’s name is equivalent to its famous native indigo-dyed cottons. Strong revivals are now making such handmade fabrics a popular comeback. You can shop around at the aforementioned walking street, but I would recommend one shop in particular because it was where I bought my two very gorgeous Mudmee-patterned pants made from hand-spun, hand-dyed cottons. Gorgeous. 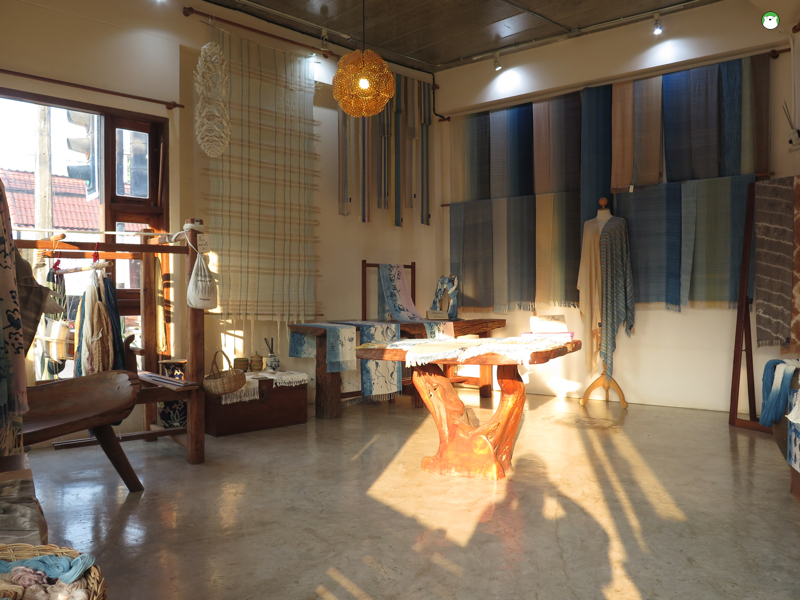 The shop is “Kram Thong’ ครามทอง and only ready-to-wear and their array of exquisite shawls are available.